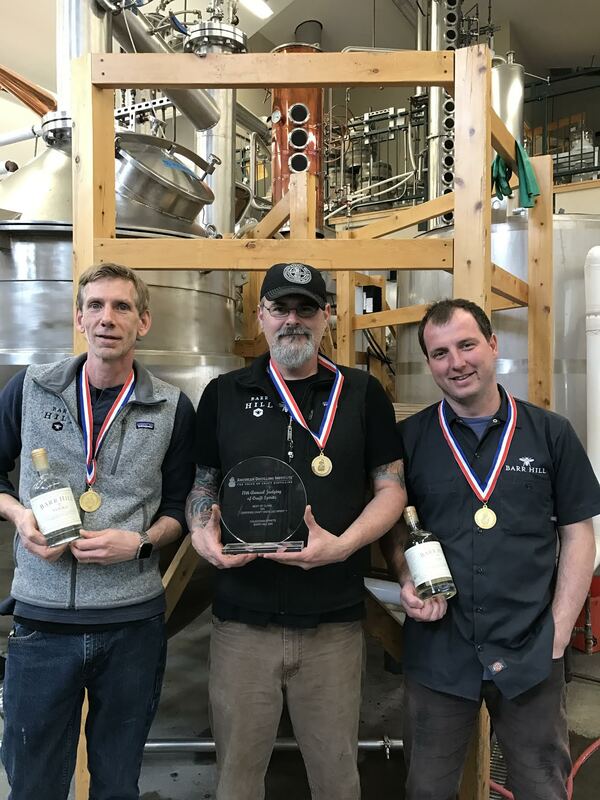 Chris Ely, pictured on left, with Lead Distiller Scott Emery in the middle and Bottling Manager Krzysztof Krysztoforski on the right. Caledonia Spirits: Chris, can you tell us a little bit about yourself? Chris Ely: I’ve pretty much lived in Vermont my whole life. I’ll be 51 years old this year. I was born and raised in St. Johnsbury. I lived in San Diego for a couple of years. I lived in Charleston, South Carolina for a couple of years, but other than that I’ve been mainly in the St. Johnsbury area, the Northeast Kingdom of Vermont. I’m married and I have four daughters, a granddaughter, and a grandson. Caledonia Spirits: What do you do for Caledonia Spirits? Chris Ely: I’m the Production Manager here at the distillery. There’s quite a range of duties with that. I do a lot of scheduling and planning, both weekly and long term based on annual projections. I lay out a roadmap for production a year in advance and I’ve become very involved with planning around the new facility in Montpelier, especially over the last couple of weeks. There is a lot of traction and a lot of work as we’re focusing on the new facility. It’s very exciting. There’s a lot to do to make sure that we hit the ground running in May of 2018 so there’s a lot to do right away to make sure that we can be ready to do that. Caledonia Spirits: How long have you worked for Caledonia Spirits? Chris Ely: I’ve just been here since last September. I’m fairly new, so not even a year. Caledonia Spirits: How did that come about? How did you move over to Caledonia Spirits? Chris Ely: I worked for Minty Conant, who is Ryan’s business partner, for about 10 years in St. Johnsbury, supplying the automotive industry. Minty has always been kind of a mentor to me ever since I worked for her. I have a lot of respect for her. I moved on and I went to work for Green Mountain Coffee Roasters for six or seven years. There were a couple reasons I left there. One is that I live in St. Johnsbury and it was an hour and 45-minute commute each way, back and forth to work and after about 6 years of that it started to impact my family. I got a call from Minty and she invited me over to talk with her and Ryan about this position. I got a really good feeling about that meeting and he invited me back to meet the team at the distillery. After about 10 minutes in the distillery I thought this is really the kind of place I’m looking for and they made me an offer and I jumped at it. Caledonia Spirits: What is it like working at Caledonia Spirits? Chris Ely: I get motivated when I walk in here, honestly. It’s a great team, companywide. I can speak specifically to the distillery team, which I just cannot say enough good things about. The entire team here, they want to make the best gin, the best vodka, in the world. Not in Vermont – we want to make the best in the world and it’s a very cool environment when you’re working with a group of people who want to be the best at what they do. Our quality standards are being driven by a team of people who want to be the best at what they do and they are very passionate about it and that is just a very cool, motivating environment to be a part of. I haven’t been a part of anything like this in a very long time and it’s just great. Everybody is really motivated to do the best that they can and put out the best quality spirits that we can put out. It’s very cool to be a part of it. Caledonia Spirits: What separates Caledonia Spirits as a great place to work? Chris Ely: I would just echo what we just talked about, although I will add that I’ve known Minty Conant for a long time and I have a great deal of respect for her. She’s been a mentor to me and the culture wouldn’t be what it is without someone like Minty. Then I think about Ryan Christiansen, who I cannot say enough good things about. The guy gets it all. He understands marketing, he understands sales, he knows how to do the politicking that he needs to do to help the business, but there is nothing that he would rather do, then be at the distillery, distilling. And that I think is a very rare thing, for an owner of a company to be that passionate. That is what has built this culture where everyone is so motivated around what we do. I think that comes from Ryan, especially. When you work for someone like that, you know, life is good. It’s very motivating. Caledonia Spirits: What makes Caledonia Spirits unique to you? Chris Ely: Ryan loves what he does. He likes to distill. He likes to experiment. He likes to be at the distillery. And that just creates an environment that is very fulfilling, and I think that’s different. That’s different than probably any business I’ve ever worked for. Caledonia Spirits: How do you personally stay up to date on your job and trends in the industry? Chris Ely: Distilling is new to me. I’ve never been involved with it before last September. I went to the American Distillers Institute conference this year, I learn an awful lot from Ryan, and I do quite a bit of research online as I learn. But then I bring a certain skill set to this job. I’m a Lean Six Sigma Black Belt and so I try to stay very up to date with the latest trends that way, mainly through peers and there are online publications and that sort of thing that I stay involved with to keep up to date. Caledonia Spirits: What is your favorite cocktail? Chris Ely: I’m not going to fib, I am a whisky guy more than anything and we don’t make enough of it. But I would say that my favorite with our product is definitely the Negroni. I had one in Baltimore maybe a month and a half ago when we were down there for a conference. It was a Negroni using Tom Cat instead of regular gin and that was outstanding. Ever since I had that I’ve been looking for another one. Caledonia Spirits: What is your favorite Barr Hill Product? Chris Ely: Overall, I would say that the vodka is my favorite product, so if I was just going to drink something straight it would probably be the vodka, but the Negroni with Tom Cat is an outstanding mixed drink.